A great start to an amazing series While it's not my favourite OR least favourite of the series episode one is definitely a good measuring stick for those who are trying to decide whether or not to spend another 9 hours of their lives watching Kieslowski's masterpiece. Most of the elements that make this series brilliant and sometimes frustrating are laid out in this first powerful episode. One thing that really made this episode great for me were the conscious directorial choices of Kieslowski. While few people would dispute Kieslowski's merits as an actor's director, he's never given much credit for his so called 'minimal' direction in terms of camera work or editing. (SPOILERS AHEAD) Consider the scene where the the boy is being fished out of the lake, how Kieslowski's camera not only lingers for much of the entire process making it all the more painful. But all the while the camera remains among the spectators far away straining to get a good look emulating the perspective of the father. Kieslowski's choice to have the father be unworried rather than hysterical after he's first told his son has fallen through the ice in itself reveals so much about his character's confidence in his calculations and technology than any speech could have. While the choice to focus on and shoot the father's lecture from the viewpoint of the son give's the viewer a sense of the son's pride and wonder at his father. 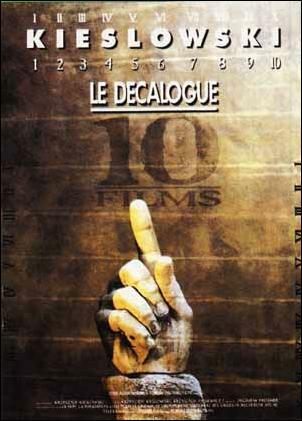 Decalogue One could most likely function as a silent film as most of its best parts are already without dialogue (such as the scene following the tragedy where the father is left staring at his computer screen). I say this not to discount the immense contribution of the Krzysztofs' dialogue but to herald Kieslowski's deft direction. After all, it is Decalogue's haunting images that stay with us long after we've seen it and lift this series high above most other films.